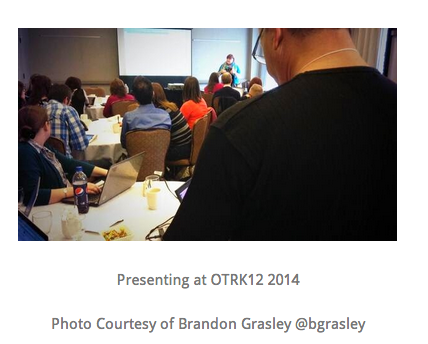 I had the fantastic pleasure of presenting at OTRK12 on April 1st, 2014. It was my first time ever presenting to a group of educators outside of my board. I loved it. Maybe it was the topic (TLD class at AMSS and the Provincial Learning Management System D2L), or maybe it was because I felt like everyone in the room understood the struggle to engage adolescents with their AT. The most powerful moments came when members of the audience shared their experience, and their questions. I was able to illustrate to this group the ways the D2L addresses the needs of some AT learners. I feel there was a strong need for educators involved with AT to connect and share. I follow the #ATCHAT hashtag and conversations on Wednesday nights on Twitter. Twitter has fast become my go-to for keeping up with AT and other edtech based questions I have. My ever-growing PLN has offered me more in two years, then all my PD days combined. I value the sharing, the questions, and the support I receive from the Twitterverse of teachers out there. This connected network of teachers, is by far the most exciting learning I have experienced. We live in a fast paced, ever-changing tech world. We educators need to keep up. We need to adapt. But most importantly, we need to teach our students, HOW to adapt to change, and HOW to wield that change to their learning needs. And that makes for exciting times as an educator. Heather Touzin is a special education English teacher with the Lambton Kent District School Board. Recently, her focus shifted to assistive technology and blending learning. For the past three years, she taught English to a dedicated one-to-one SEA computer class, at Alexander Mackenzie Secondary School in Sarnia. Currently, she provides support to secondary AT students, resource teachers, and classroom teachers in her board. Congratulations on bringing your knowledge and expertise to educators outside of your board! I heartily agree with your comments about supportive Ontario educators – they are a fantastic bunch of generous folks who are so engaged in their own learning that’s it’s contagious! It’s such an exciting time to be an educator!